Another specialized e-commerce start-up has launched operations to tap onto the demand for products and services online. 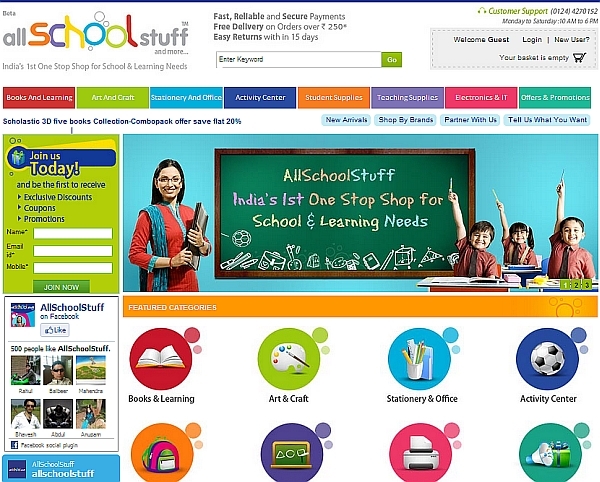 AllSchoolStuff.com has launched as an online retail store for education needs catering to demand from the K-12 school segment and positioning itself as an online destination for students, parents, teachers and schools looking for branded products. The site has more than 10,000 items that include school text books, stationery, note books, art and craft materials, school bags, water bottles, school uniform, school shoes, sports items, music instruments, science projects, exam guides, fancy dress costumes and science kits. Pre-School products such as educational toys, activity sets, flash cards and picture books, puzzles, shapes and abacus are also available. It also features movie merchandise targeted at children. The products are categorized as per age, class, subject or activity and the company offers free home delivery for all the purchased products. The company operates its own warehouse and supply chain system and has also joined hands with logistics partners for deliveries. The start-up was founded by Manoj Chandra, a senior retail professional who was last heading the marketing portfolio for Bata India and AnkurGarg, an IIT graduate with over a decade of experience in ecommerce technologies and targets the fast growing market for educational supplies (growing at 20 percent per annum) which is estimated to be over $5 billion in value. "India is the largest education market in the world with over one million schools and over 450 million school going children. Our objective is to facilitate the easy access of educational products to millions of students and their parents," said Manoj Chandra, founder & CEO, AllSchoolStuff.com.